For one, I have not been able to get the Aureus cardigan out of my head since I first saw it. I know, I know, everyone loves Pom Pom Quarterly but I live under a rock (I've probably mentioned that before) so even though this issue came out over six months ago, I just stumbled upon the patterns recently. I was desperate to get my hands on a hard copy of Issue 7 but not really eager to pay for shipping internationally, and obviously it's been sold out in all my local yarn stores for quite some time. Then my boss offered to give me a knitting related going-away gift, and so I begged asked her nicely to order me a copy. I am so excited. 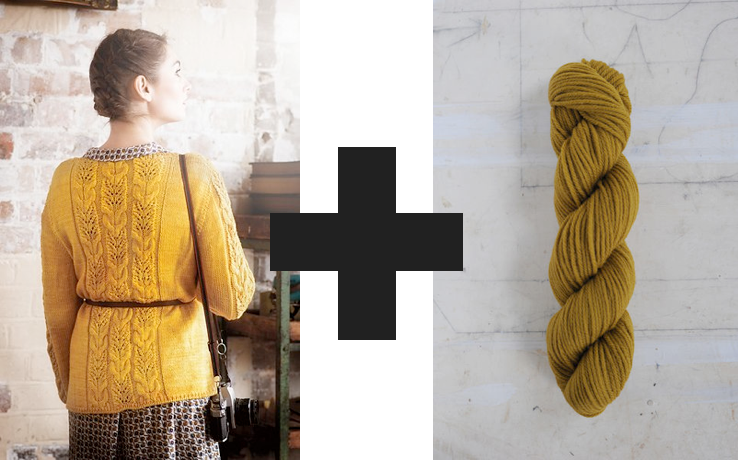 Secondly, as mentioned in my first knit wish list post, I am being encouraged to branch out a little in color. While the turmeric color of the sample is absolutely stunning, it is a little beyond me. But I finally had the chance to see and touch some Quince & Co. yarns in person recently (they are as lovely as expected), and I was immediately attracted to the Honey colorway. It's just enough of a mustard to be a "color" but, in my mind, easy to balance as a neutral. After all, you can wear honey with grey, black, navy, cream... you know, all the exciting colors my wardrobe has to offer. And it's in the yellow color family - if that's not a good color for combating grey Oregon skies, I don't know what is. I'm hoping to buy the yarn and cast on before the end of the week, but I actually have two other WIPs on the needles already. More on those as soon as I get a good photo or two. I'm not usually one to start a bunch of knitting all at once, but what else is an unemployed girl to do? ahhh our wardrobes appear to be quite similar (and i recently knit at grey and mustard shawl.....that works beautifully with everything).....i love your choice of color, and of course----who doesn't adore that sweater??!!? ?